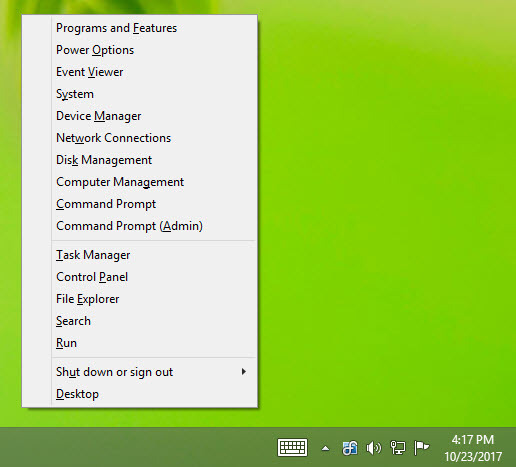 The Windows 8 Tweaks in DisplayFusion provide extra options so that you can customize Windows 8 to your liking. Bypass the Start Screen to go directly to the Desktop, move the Power User Menu (Win + X) to the current mouse position, reduce the size and move the Start Screen to any monitor, and even adjust application window border sizes! 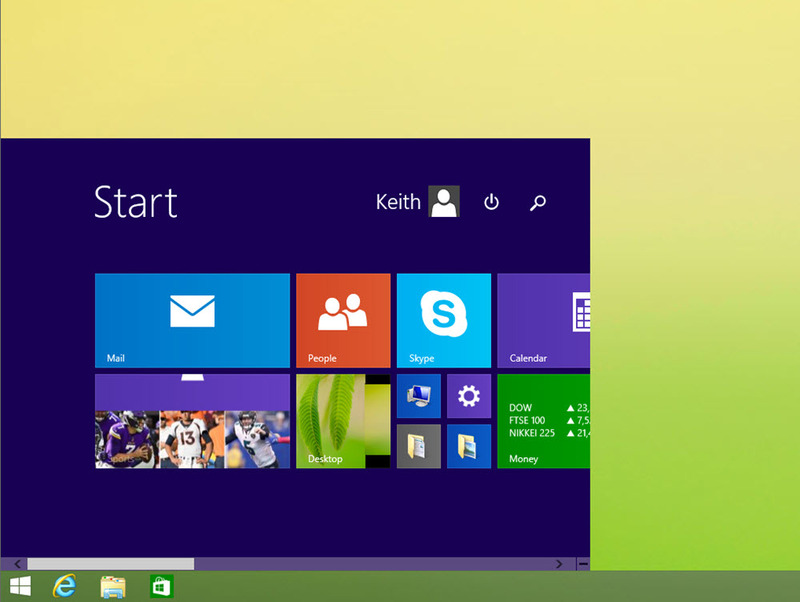 Bypass the Windows 8 Start Screen: Have DisplayFusion automatically bypass the Windows 8 Start Screen on startup, allowing it to boot straight to the Desktop. Hide Windows 8 Lock Screen: Disable Windows from showing the lock screen image, so that the user login screen is immediately accessible on startup or workstation lock. Enable mouse sticky corners: Don't have a need to use the hot corners in Windows 8 on your workstation? Use this option to disable them or re-enable them as needed. Move the Power User Menu to the mouse cursor position: Don't like how the Win + X menu always opens in the bottom-left corner? Have DisplayFusion automatically move it to your mouse cursor position. Mini Start Screen: Use DisplayFusion's Mini Start Screen feature to reduce the Start Screen from full screen to a specified size, and have it move to any monitor that has a DisplayFusion Taskbar when the Start button is clicked! 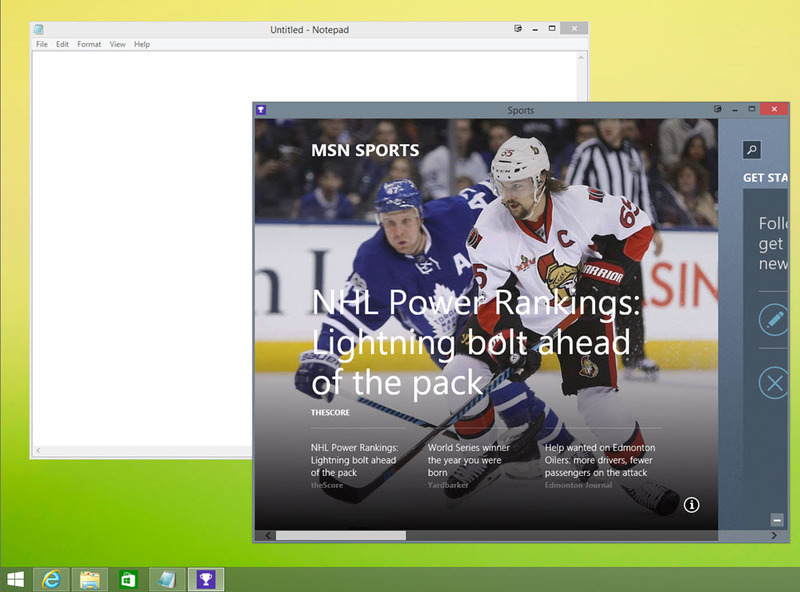 Window Border Size Adjustments: Windows 8 removed the ability to customize the size of application window borders. Use the DisplayFusion Window Border Size settings to increase or decrease the size of the window borders as you see fit. Lock Screen monitor timeout: By default in Windows 8, your monitors enter sleep mode at the lock screen after 1 minute, with no simple way to change it. 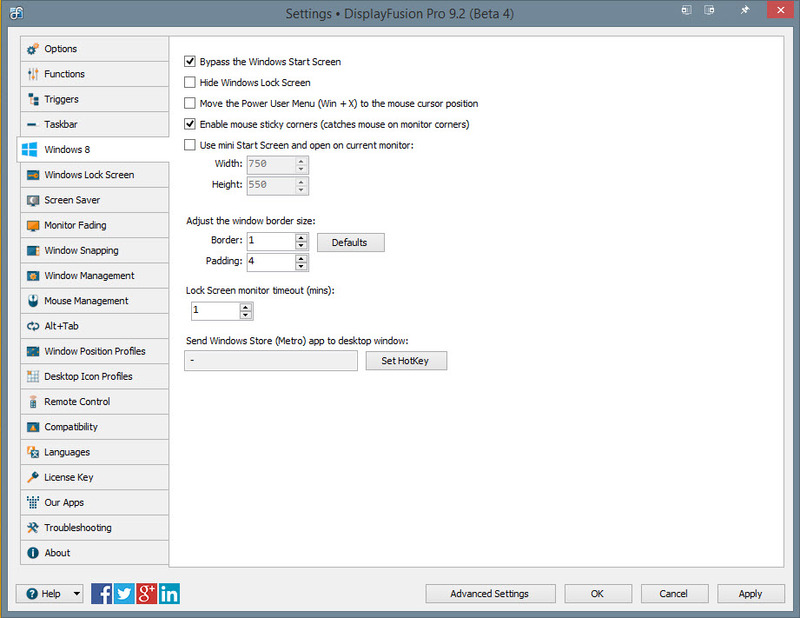 Use this option to adjust the Lock Screen monitor timeout quickly and easily! Send Windows Store (Metro) Apps to Desktop Windows: Set a key combination for this feature, then run it on any Windows Store app to send it to a resizeable window on the Desktop.